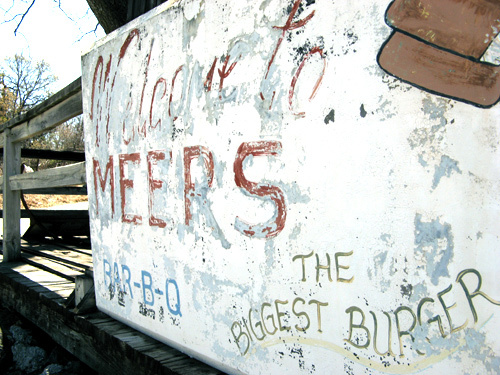 Several folks had told me that if I planned on being anywhere near southern Oklahoma I had to stop at the Meers store, so I did. I wasn’t sure what to expect. From photos it seemed as though it was located miles and miles away from civilization. It was in a remote location, to be sure, but there was civilization within a mile or so. The parking area outside was full with tourists snapping pics in front the building. Clearly lots of people tell lots of other people that if they are traveling in the area they simply must stop here. The inside has a run-down roadhouse feeling, the chairs slightly wobbly, and tables made of old wood. 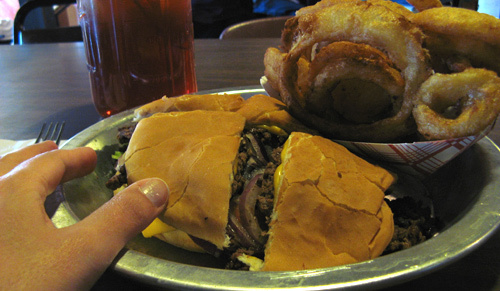 I sat down in one of several dining areas and ordered an iced-tea, cheeseburger and onion rings. Within a few minutes the waitress, clad in a Meers t-shirt, delivered my food in pie tin–the chosen platter for the burgers. So how was it? It was good, delicious. But was it drive-several-hours-out-of-your-way good? Hmmm, that’s where I think it fell short. The burger was full of flavor and juicy, but frankly I’ve had other delicious burgers in my time. The onion rings are beer battered and extremely rich. I couldn’t finish my plate–there was simply too much food. Bottom line, if you’re nearby, you should stop for a taste of the locally raised longhorn and to see a little piece of history. 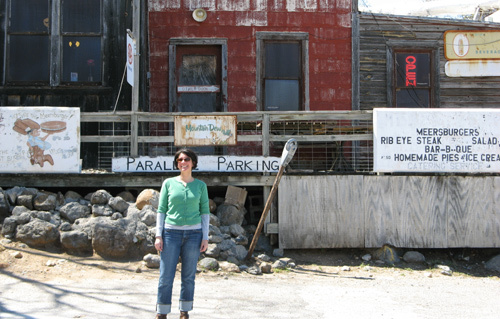 One of the diners was kind enough to take a photo of me in front of the restaurant. He was there with his wife and told me they had just moved to Oklahoma andwere getting to know their new state. He also informed me that the first parking meter was installed in Oklahoma City, hence the reason he suggested I stand in front of the now-defunct meter for the photo. This entry was posted in burgers, travel. Bookmark the permalink. Both comments and trackbacks are currently closed.